LEARN. DISCOVER. MEET FRIENDS. BUILD A NETWORK. GROW PLANTS. For students and recent graduates interested in urban farming, sustainability, hydroponics, startups or the future of food, interning at Farm.One is a unique, varied and challenging learning experience. There is no other opportunity like this. 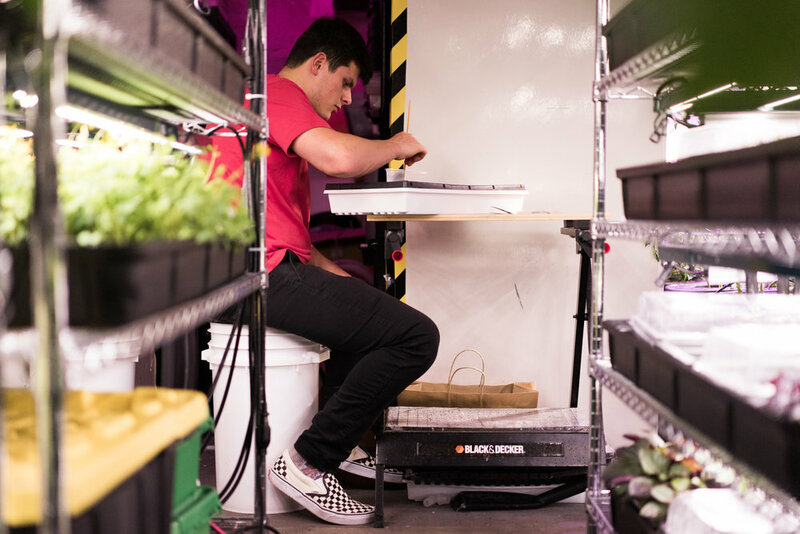 Inside our purpose-built facility in the heart of Manhttan's Tribeca, Farm.One grows in a compact, completely clean, controlled indoor environment with color-enriching LED lights, hydroponics and a chef's touch. Who are the kind of people who intern at Farm.One? What are their backgrounds and interests? What made Farm.One stand out as a place to apply for an internship? There are dozens of different focus areas for an internship at Farm.One. Which things did our interns get up to this year? Internships are all about learning. What are the key things our interns remembered? Who should intern at Farm.One? Farm.One internships can start on the schedule of your school and your commitments. Apply now using the link below to start a conversation and find out if we're a good fit. Generally, we prefer interns who are able to commit to more than 16 hours per week of attendance. Less than this, and our ability to give you fulfilling, interesting projects that will allow you to learn, is reduced. Interns are expected to dress appropriately, with sensible shoes and clean clothing that may get wet or dirty during your session. Hygiene and safety are important on the farm. You must comply with the directions of our Farm Manager. You may be assigned manual labor tasks during your training period. These tasks may include cleaning up and other essential activities. Interns ability and enthusiasm on these tasks may decide their eligibility for higher-level activities. We reserve the right to suspend or end internships at any point in time. Not sure if interning is for you? Wondering how to approach it? Our CEO Rob Laing wrote the book on first-time jobs and internships: First Job Pointers. Buy the eBook online now for information and advice on your first job or internship. Farm.One internships are learning opportunities. Interns are given specific projects and opportunities to focus on areas they find most interesting. As such, interns are not compensated beyond covering basic expenses. Full- and part-time job opportunities are clearly posted on our site, when available. To find out more if an internship is right for you, use our application form above. Farm.One cannot sponsor visas for overseas students. If you are a student outside the US and you wish to intern with Farm.One, it is your responsibility to arrange the necessary paperwork to visit, and to ensure you satisfy all the legal requirements to take on an internship in the US. If in doubt, speak to your local US embassy or consulate. The internship was great. But what's next?